Summer or winter, I love to have cozy bedrooms. Layers on the bed, plenty of throws and pillows, and candles are staples. I also love to add Christmas touches to my winter bedrooms. Not too many, just enough to help my home flow during the holidays. As a child, I loved to look outside and see our multi-colored Christmas lights. The only thing I had inside my room, though, was a ceramic Christmas tree with colorful plastic pieces that lit up. Adding a bit more in recent years has been wonderful. 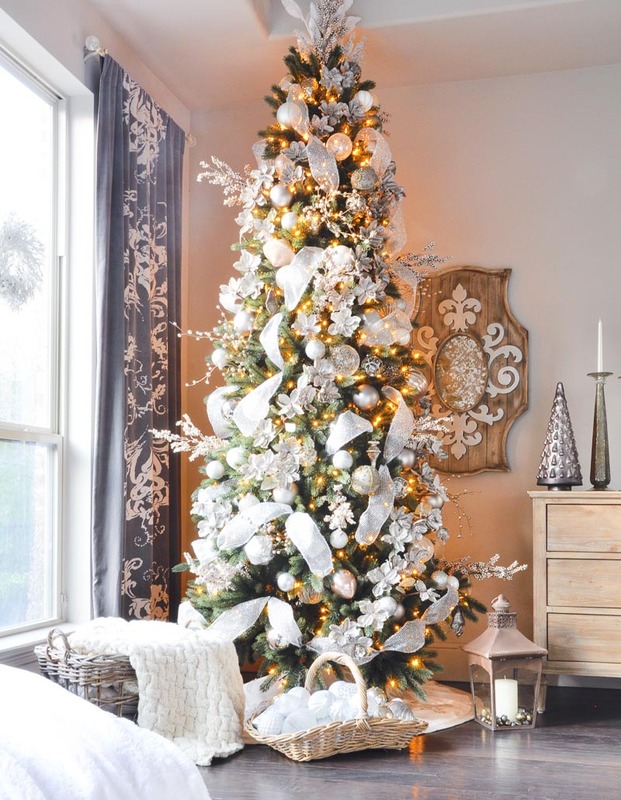 I try to keep it simple, but in the master bedroom, I love to include a tree. The twinkle lights are magical and romantic and I’m rarely in a hurry to put it away after Christmas. *Affiliate links used in this post. Find our full disclosure here. Decorating this tree took a fraction of the time it took to decorate our living room trees. 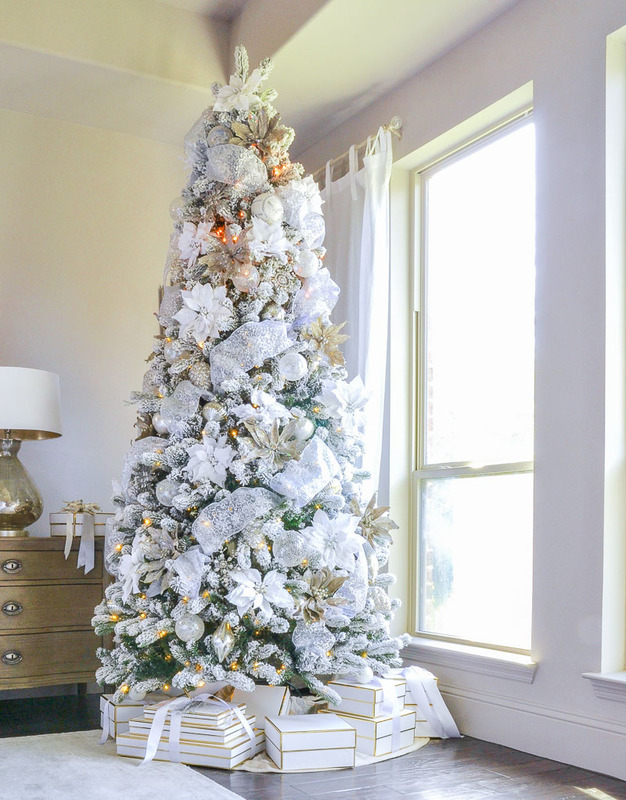 I used wide ribbon, lots of poinsettias, and just a few ornaments to get give it a subtle, finished look. 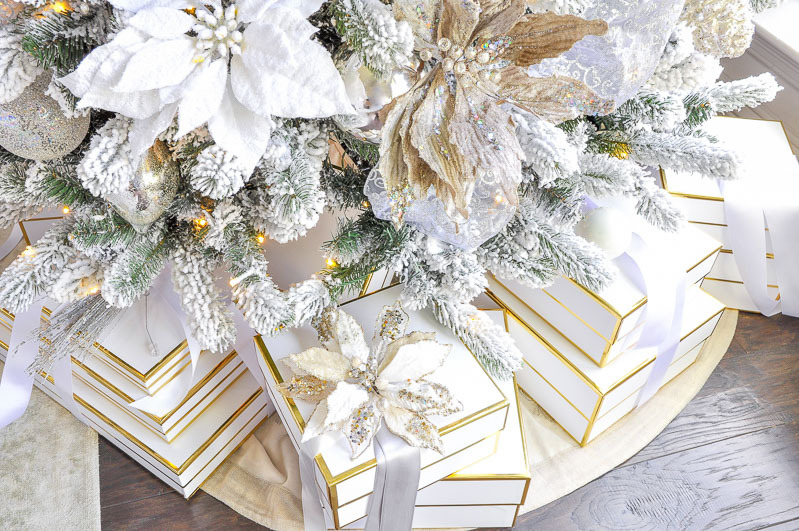 Gift boxes add to the decor. These are my favorites and can be used empty or filled with gifts to give your tree a finished look. For my Christmas look last year, I put the tree on the right side of the windows. This year, I moved it to the bed wall. Walking past the room and catching a glimpse of the bedroom tree has been wonderful. 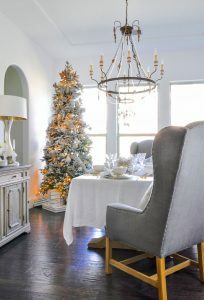 When you choose the placement of your trees, it’s nice to find a spot where it can be enjoyed from additional spaces. 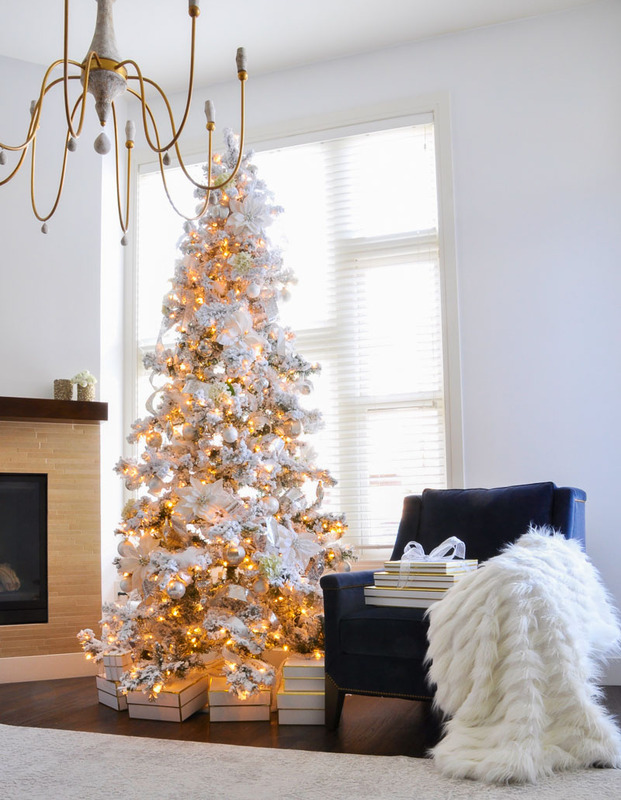 A beautiful, lush, over-sized throw by my friends at Pom Pom at Home and a view of the tree makes this lounge chair a perfect winter spot. 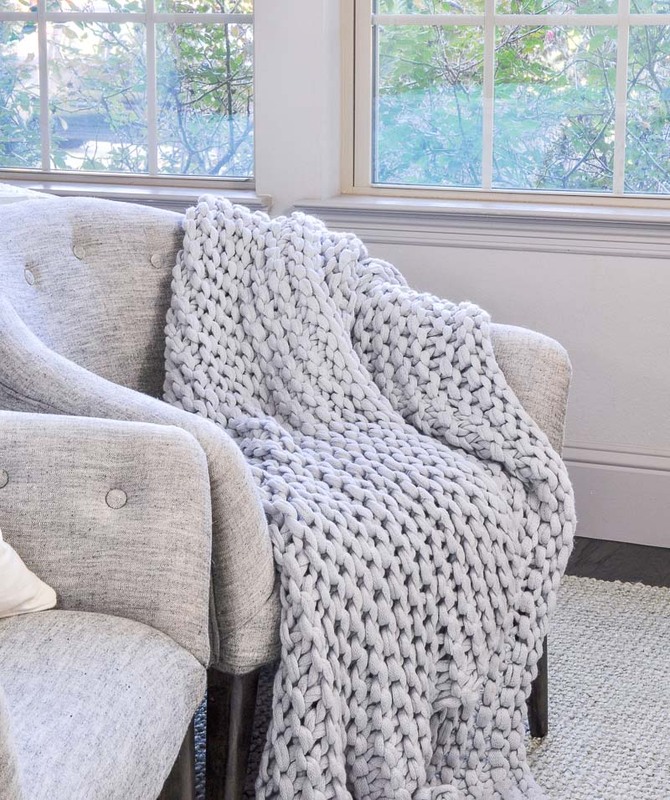 The throw is perfect for any room in the house, but I want to keep it all to myself, so it’s in here! Don’t miss my pom pom throw on the settee. Great throws are my go-to items for winter. You simply can’t have too many! It’s so nice to sit near a sunny window on a cool winter day, although we don’t have all that many cool winter days here in Houston! You’ll see my favorite pillow has a new home. Buying things that work in multiple locations is by far my best home decor shopping tip! I ALWAYS follow it. On the bed, I love using this velvet quilt and shams during cooler months. 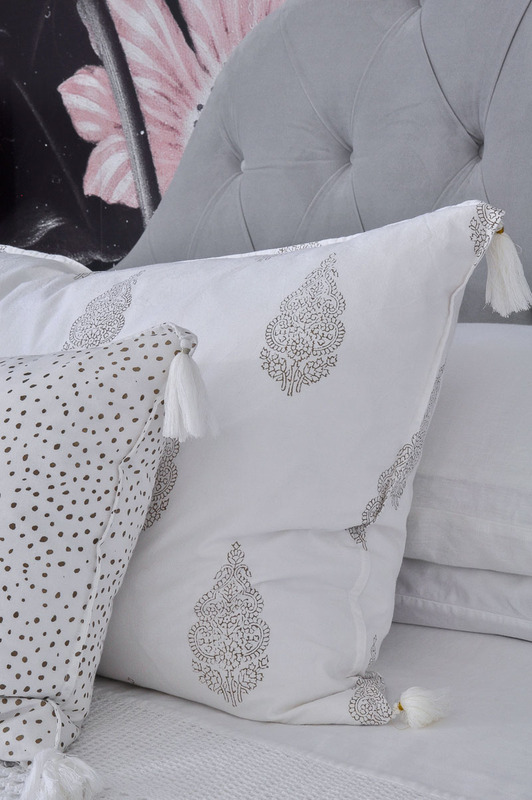 Both mix beautifully with my white euro shams and white duvet cover. 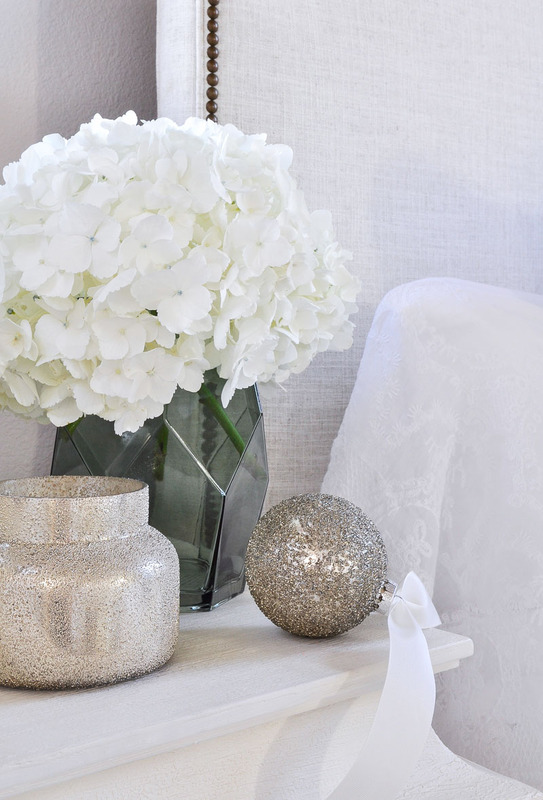 A glittery spray is all you need on your nightstand. For mine, I simply combined gold leaves and a small faux evergreen spray. I used a piece of grosgrain ribbon to tie them together. After the holidays, I can put the spray away and the nightstand will still look nice with the iridescent vase and silver lamp. Would you like to see our guest bedrooms? I added winter touches first and then a bit of Christmas. 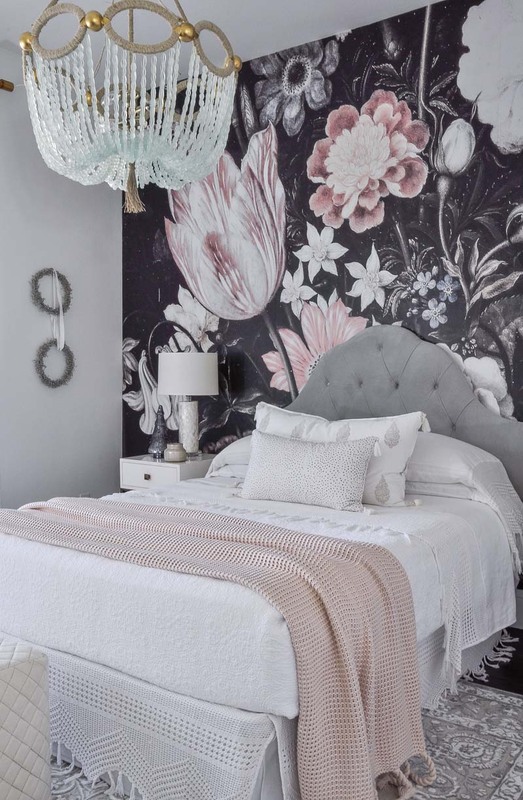 The first one has a big floral mural, which some might consider to be a challenge this time of year, but there is always a way to “winterize” a room! First, I added this beautiful blush throw. It’s so cozy and also by Pom Pom at Home. It has been extremely popular this season and I can see why! I recommend using an over-sized throw as a statement piece. In this room, because it is so large and also the only colorful item besides the wallpaper, your eyes go straight to it when you enter the room. It immediately provides a feeling of warmth and comfort for winter. 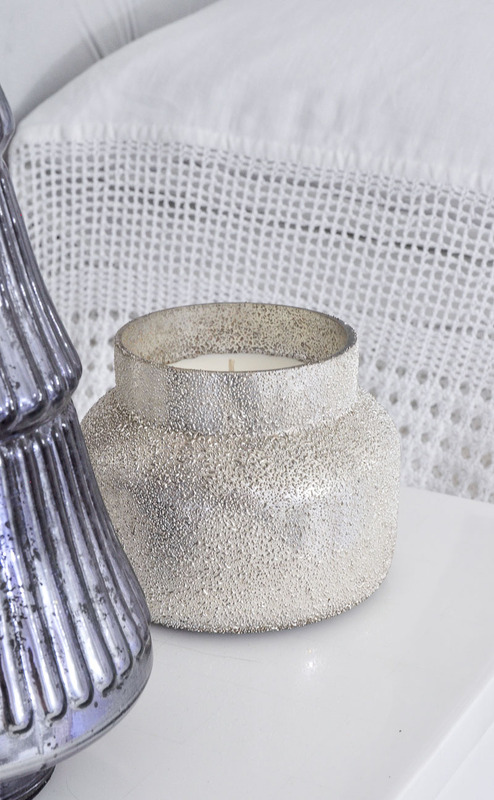 A pretty winter candle, a mercury glass Christmas tree, and a couple of beaded silver wreaths complete the look. Our third bedroom has a neutral look most of the year. I found this beautiful mirror to add above the bed. It is another fabulous design by Aidan Gray. Adding green for Christmas and winter became the obvious choice for me when I found these green velvet pillows last fall. I also added this duvet cover and shams. A hand-knit, chunky throw (also by one of my favorites, Pom Pom at Home) adds texture and warmth to this chair. I wish you could feel how soft it is! It comes in three colors and is a definite wish list item for more spots in my home!!! 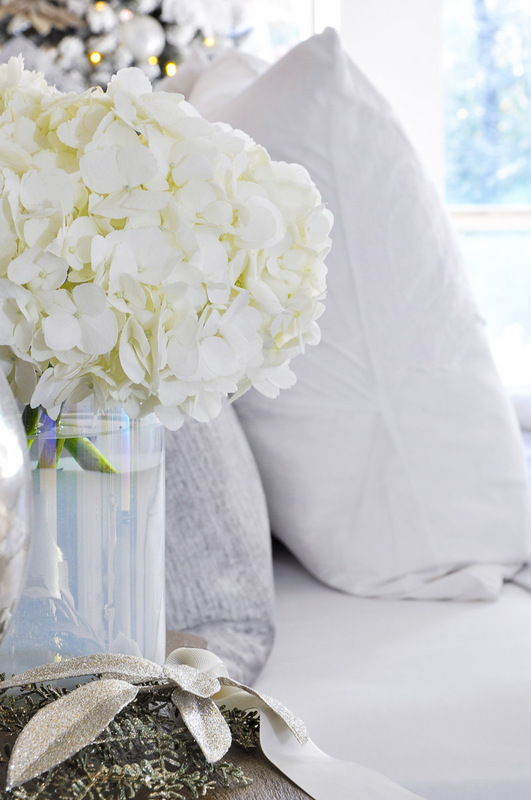 Finally, the bedside table got a bit of green with a versatile glass vase. 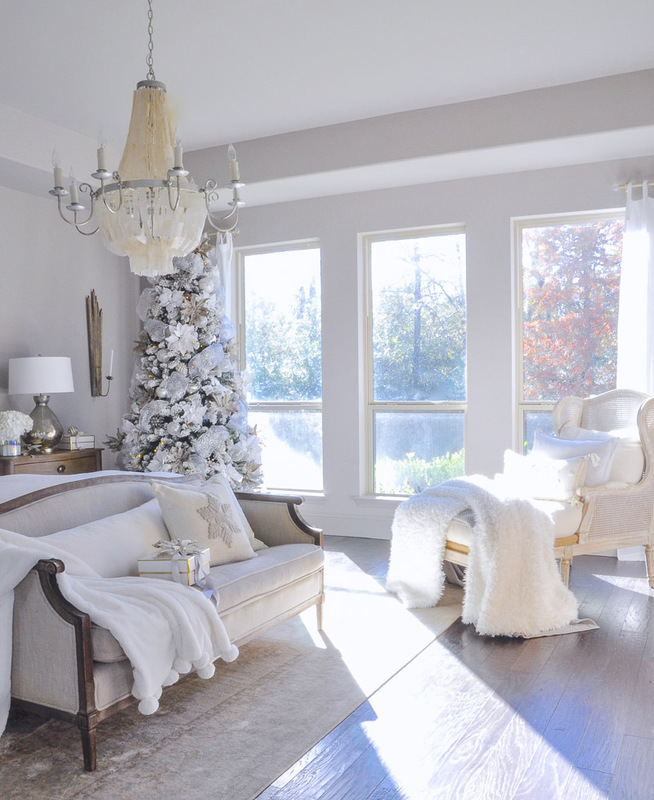 Winter bedrooms with Christmas touches give your holiday home a magical look and an easy transition from holiday decor. I hope you’ve found some ideas for Christmas, winter or both today! *Some products were provided for this post. 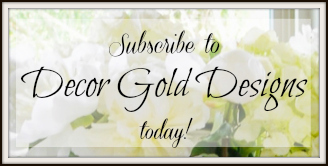 Each piece was selected by the owners of Decor Gold Designs. As always, all opinions expressed are our honest opinions. 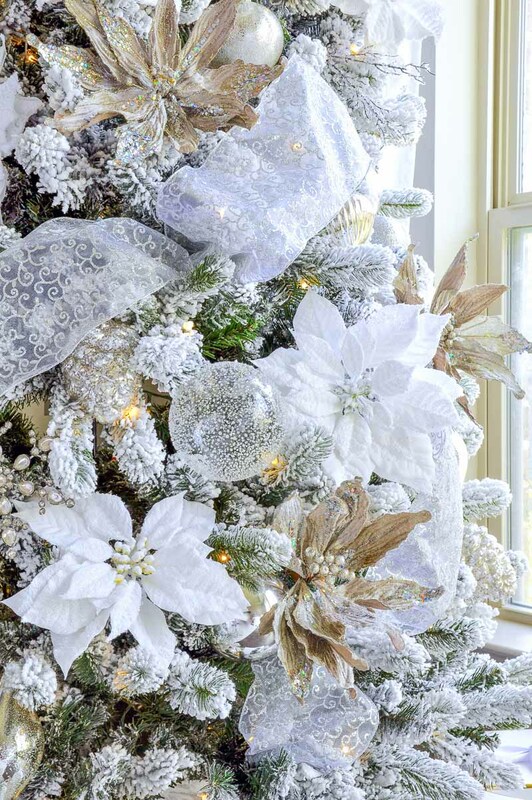 Every room looks festive in an elegant, peaceful way. I love your lamps and as always I swoon over your collection of vases. 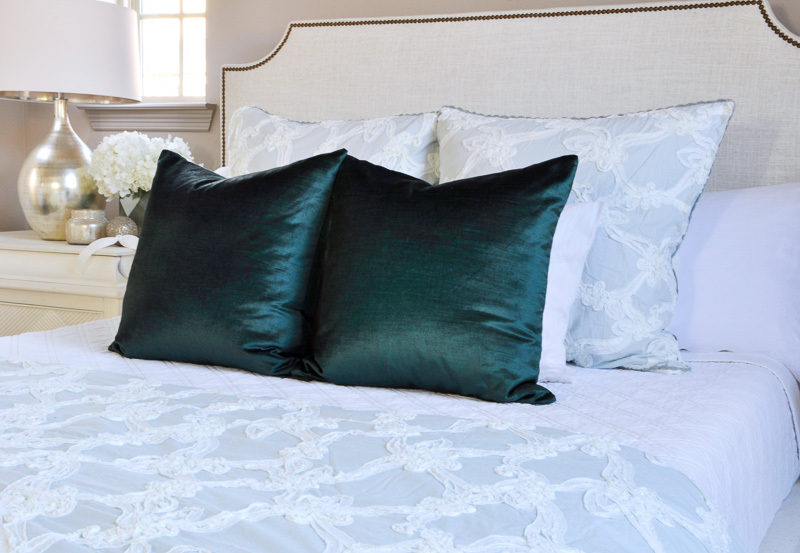 And the bed linens are luxurious and heirloom worthy – absolutely gorgeous! Happy holidays, Jen! 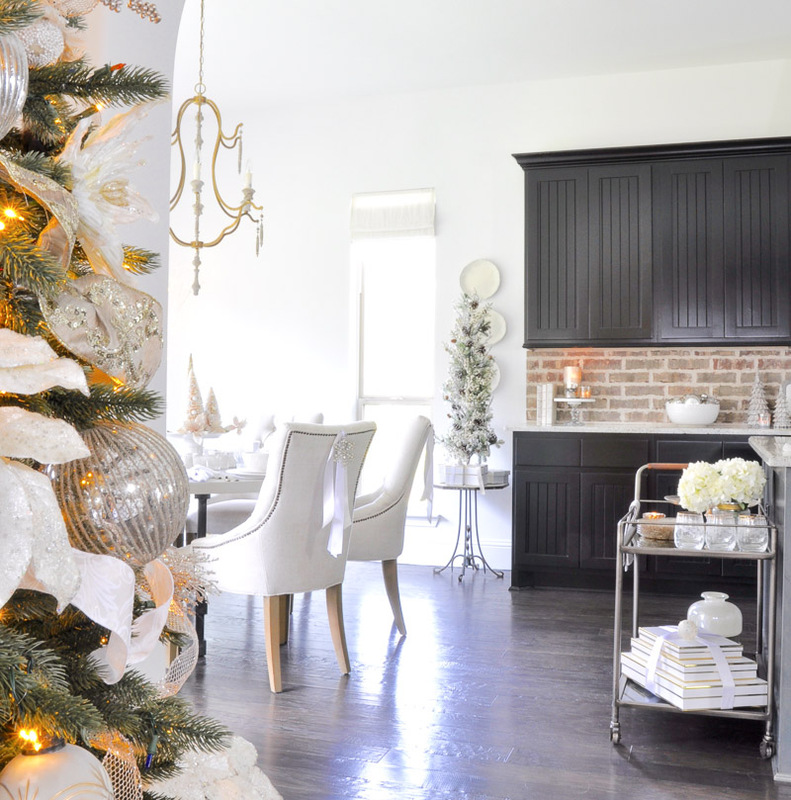 Love all the Christmas touches – every room is warm and inviting, without being overpowering! Absolutely gorgeous Jen. Merry Christmas!!! Thank you Tana! 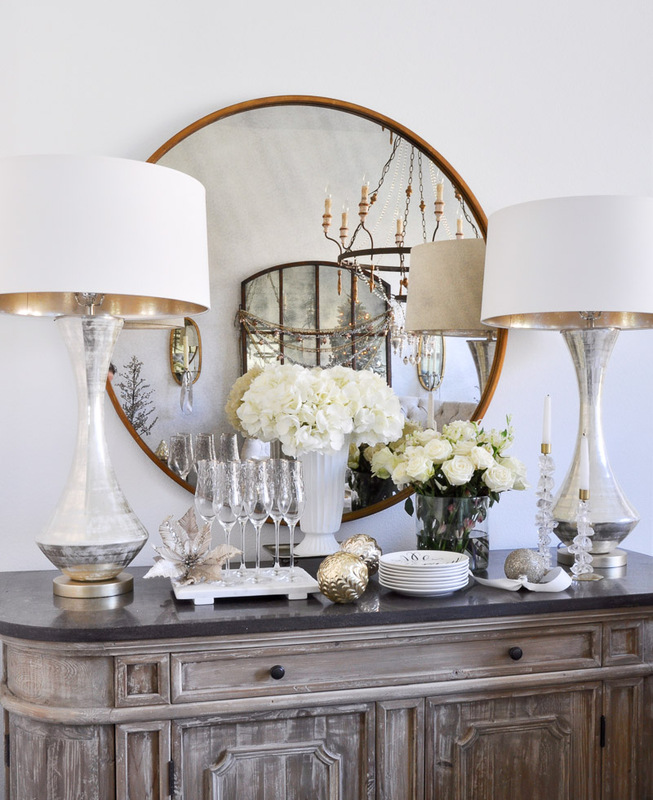 It is always so much fun to dress up our homes for the holidays! Love you my friend!!! 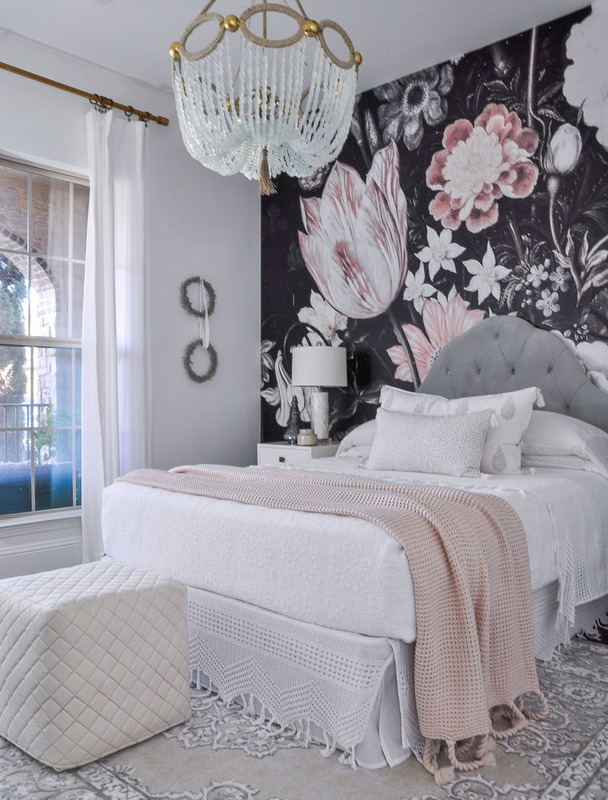 Your bedroom is a perfect winter wonderland. 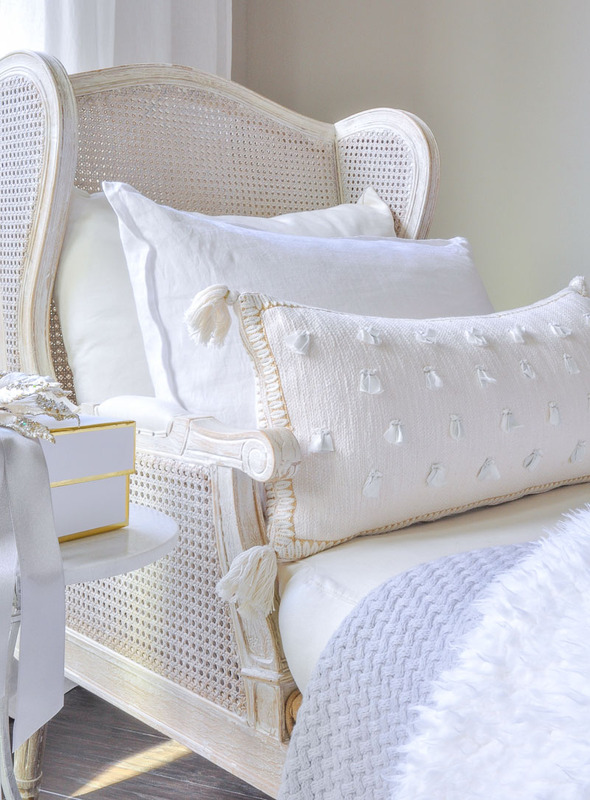 I love all the touches of white throughout. So pretty! The link does not take you to the pillow on your chair. I’m loving it and would like to buy. Is it sold out? No, it’s the one on the lovely wing back chair. It is a lumbar pillow with ribbons or threads. The link takes me to a multi coloured small square one. I sent you an email with a direct link. Please let me know if you did not get it. I love the headboard and bed in here! I see the link to the headboard, but I am wondering what base you bought? Also what height did you purchase? Thanks! Love your designs as I try and wade through decorating my new apartment. Sorry, this is an old post and I’m just seeing your comment. I got the bed from the maker, but I only have an online source for the headboard. I selected the shorter option. Hope this helps!